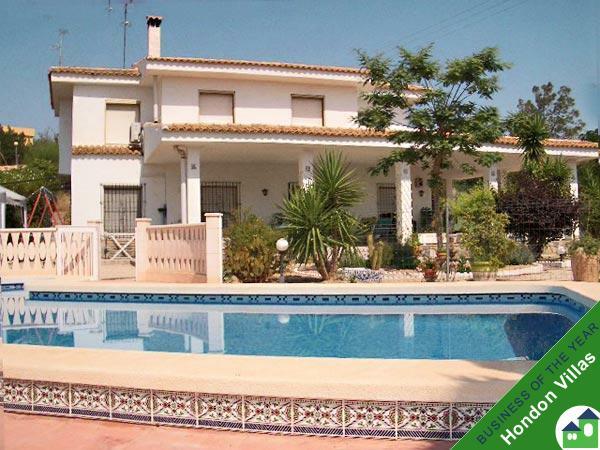 Hondon Villas are pleased to bring onto the market for sale this detached villa. This well presented detached villa is situated in the countryside close to the small hamlet of Lel. It is only a short drive to the town of Piñoso, with a choice of bars and restaurants and all local amenities. This two storey house comprises lounge with a wood burning fireplace and has patio doors leading to a covered terrace overlooking the walled courtyard.There is a modern kitchen, with granite worktops, additional walk in storage and breakfast area with patio doors leading to the garden. There is a utility room and the third bedroom/office. Upstairs both bedrooms have large en suite bathrooms,walk in wardrobes with patio doors leading to a terrace with amazing views over the surrounding countryside. Outside there is a beautiful landscaped garden with a selection of almond and olive trees. There is a walled courtyard garden leading to the pool area with a covered terrace to enjoy al fresco dining. The pool is 10 x 5 and is solar heated. Well the Hondon Valley has a long agricultural history and as such affords many old fincas, villas and country houses in need of new love, reform or refurbishment. As time passes what were glorious houses in the Valley have suffered the ravages of time and climate or just been left to deteriorate. New money and new ideas can transform these neglected Hondon homes into modern dream villas. And many already have, including cave houses and farm houses. In general re-building or renovating an old finca villa is cost effective with cheaper labour and building materials if you are prepared to roll-up your sleeves and get stuck in. We at Hondon Villas and our established partners can advise on planning, architects, contractors and tradesmen to help you along the way. We have selected the reform Spanish properties that are ripe as a refurbishment, reform or renovation project. 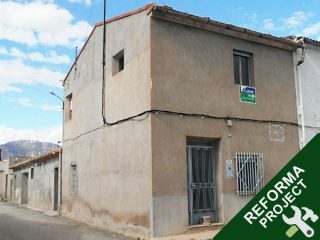 If you are looking for a bargain Spanish property restoration project that you can rebuild and reform to your dream home these might be for you. They have many possibilities subject to planning of course. If you want HONDON AREA LAND to start afresh then please check out our Hondon Valley Land for sale page. Available from Hondon Villas, your local AIPP REAL ESTATE AGENT / inmobiliaria. Buy or sell property. Visit our real estate office in Frailes Plaza. NEW REDUCED PRICE! Asking Price: €229,950 ( Recently reduced from 289,000) A large Detached Villa on 2 Floors near to Macisvenda with excellent mountain views and in great condition. The ground floor houses a separate guest accommodation with patio and private walled pool and jacuzzi. This property is at a great price and really must be viewed to be fully appreciated. Priced to Sell! The villa comprises of fully fitted kitchen, utility room with open plan Dining room and lounge with marble fireplace, there are 3 bedrooms with double fitted wardrobes, master bedroom with en-suite and walk in shower. There is a stunning glazed in naya with panoramic views towards the mountains and the village. Outside there is 8 x 4 private pool, and jacuzzi completely walled in with Built in lights. There is a outdoor shower room and W.C. The garden area has 2 tiers, separate gate to the bottom land, Storage room, ample space for parking, and in an elevated position. Underneath the house is a separate apartment comprising of a lounge, double bedroom, wardrobe, and shower room (en suite) perfect for guests. 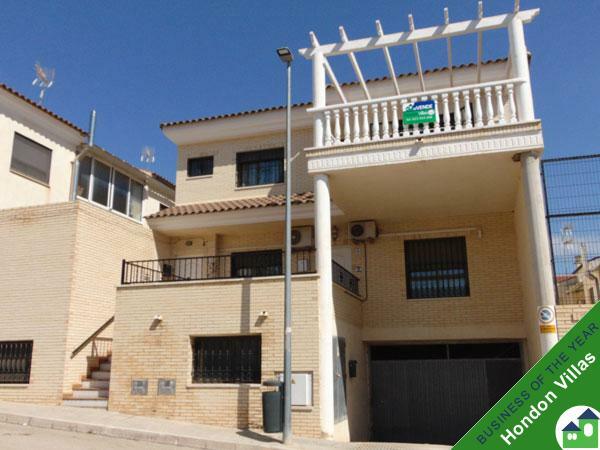 BARINAS VILLA FOR SALE: Hondon Villas are delighted to offer for sale this spacious detached villa close to Barinas (Murcia, Spain) with all-round views and truly beautiful characteristics like the beamed ceilings and herring bone style tiles floors. This 3 bedroom, 3 bathroom property is priced to sell and really must be viewed to be fully appreciated as it is immaculate and easy to maintain. This spacious villa comprises of a open plan living room, with a wood burner, and a dining area leading to a separate fully fitted kitchen with a double Belfast sink. There are three double bedrooms, all with large fitted wardrobes. The master bedroom benefits from an en suite shower room and air-conditioning, and there is a further family bathroom. Throughout the villa there are high beamed ceilings giving a light, airy feel. There is a pretty sun room leading to a large open terrace overlooking the swimming pool and the mountains. Close to the pool is the outdoor kitchen and barbecue area, an outdoor shower room, with it’s own water heater, and a storage room. Attached to the house is a large garage with a utility area. This has the possibility to be converted to extra accommodation should it be required. 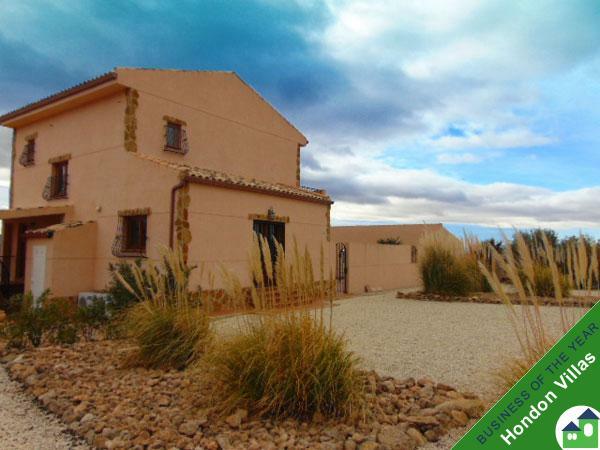 In addition to the enclosed, landscaped garden is an Almond Grove of approximately 2,000m2. The property is situated in close walking distance to Barinas which has a good selection of bars, .restaurants and shops. It is only a 45 minute drive to the coast and Alicante airport. 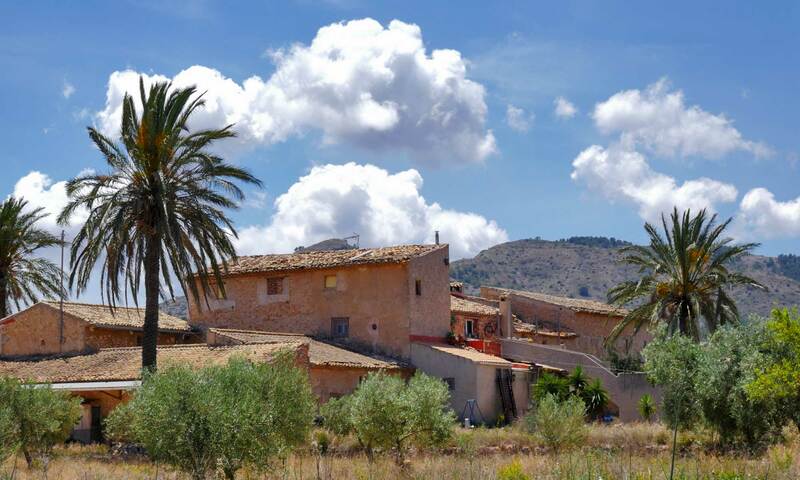 Hondon Villas are pleased to bring onto the market for sale this bargain priced villa in La Matanza with beautiful mountain views, and only a 10 minute drive to the town of Orihuela. The villa comprises of a fitted kitchen, a lounge, 4 bedrooms and 2 bathrooms. 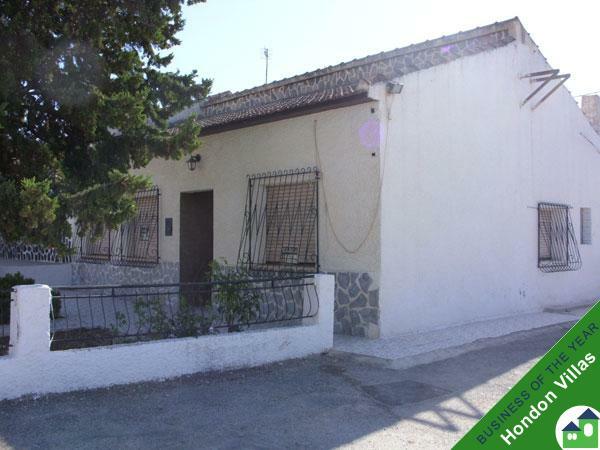 This property is in need of some updating and decorating as it is a very traditional Spanish type house. Outside is a generous plot size with ample space for the installation of a swimming pool. At this price it must be viewed to be fully appreciated! Hondon Villas are pleased to bring on the market for sale this stunning two storey five bedroom 2 bathroom detached villa with private swimming pool and garage. This stunning well maintained 2 storey villa has five bedrooms and two bathrooms. There is a large lounge area with working fireplace, dining area, fitted kitchen diner. All rooms have large windows for plenty of natural light. Outside there is a private patio with BBQ private pool, garage and padel court. The gardens are well maintained and the villa has panoramic views. 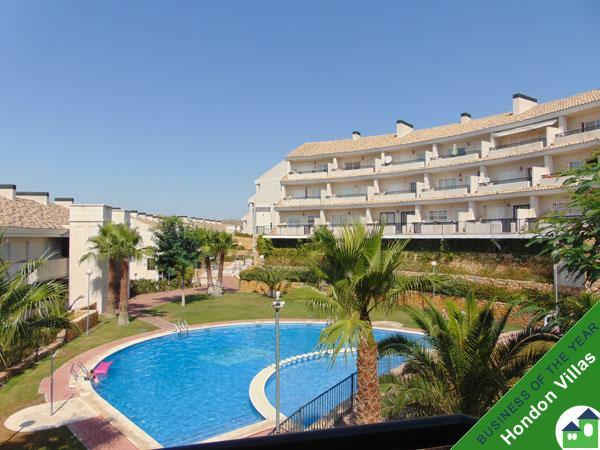 Hondon Villas are pleased to bring onto the market for sale this third floor apartment in Alenda golf. The apartment comprises of a fitted kitchen, lounge, 2 bedrooms with fitted wardrobes, master with en-suite and a family bathroom. This property benefits from 2 communal swimming pools, walking distance to Alenda Golf Club, with a restaurant and state of the art Gym.Includes air conditioning, electric radiators. In addition the property comes with two underground parking spaces and two store rooms. #535 Fortuna Villa For Sale with Large Games Room. SPANISH VILLA FOR SALE: A large (350 sqm) and immaculate two storey villa close to historic Fortuna in Murica with breathtaking views and truly beautiful characteristics. The large ground floor has guest accommodation and a well equipped entertainment room with its own bar and games facilities… large enough for a full sized snooker table and home cinema! Party on! This is perfect for large family visits and parties with its 6 bedrooms, & 3 bathrooms, a downstairs guest apartment and a large entertainment room leading to a private pool. There is plenty of terrace and balcony areas to enjoy the views and peaceful settings. There is a large driveway, with space for several cars leading, to the garage. The garden has been designed to be low maintenance. In addition the property benefits from an electric gate, air conditioning, satellite TV, Internet and an alarm system. The outdoor living space is extremely well thought out with a lovely, shaded terrace, overlooking the private swimming pool, with an outdoor kitchen and barbecue, perfect for al fresco dining and entertaining. The property is perfectly located to give you access to Murcia, only 25 minutes, Alicante Airport 40 minutes and the same to the Costa Blanca, with a great selection of beaches. Close by there are are several bars and restaurants within walking distance and a two minute drive to Fortuna and the famous spa baths. If you love to entertain this would be the perfect house for you. This property is a great price and really must be viewed to be fully appreciated. 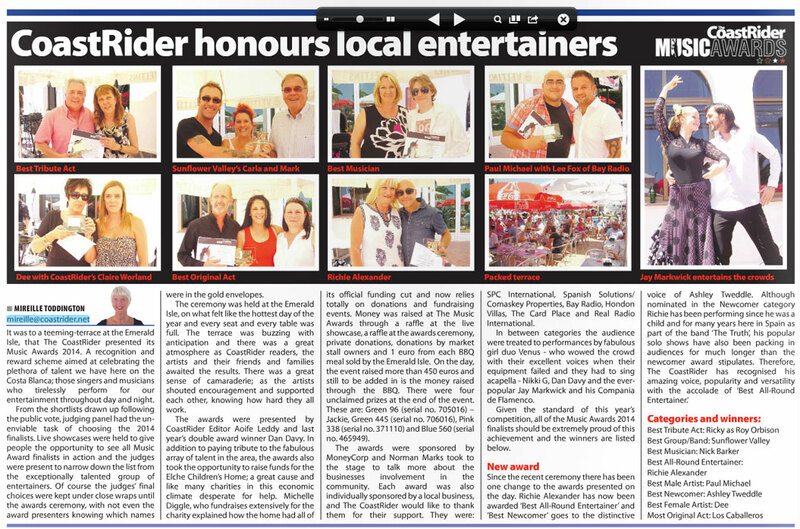 Each year the ExPat newspaper “CoastRider” runs and hosts the CoastRider Music Awards covering the Costa Blanca South in Spain. Various categories are voted for by the public through their weekly paper or online. Our very own Property Agent “Hondon Villas” in Hondon de los Frailes were proud to be a Sponsor of the event and Maureen and her team from Hondon Villas helped give out the awards to local artists in a lavish party in La Zenia.